One of the main storylines in the Heavyweight division in 2016 was the highly anticipated rematch between undefeated unified WBO/IBF/WBA/IBO Heavyweight world champion Tyson Fury and former longtime champion Wladimir Klitschko. Due to a plethora of circumstances however, the rematch between the two did not take place and ultimately Fury relinquished his unified world championship. Although the situation involving Fury, Klitschko, and the circumstances which led to the rematch not occurring dominated much of the landscape of the division in the last year, there were other events that took place and fighters who were able to establish themselves as players in the absence of both Fury and Klitschko. The most established of those fighters was undefeated WBC Heavyweight world champion Deontay Wilder, who will be entering his second year as a world champion in 2017, successfully defended his title twice in 2016 scoring knockouts of top contender Artur Szpilka and former world title challenger Chris Arreola. Wilder has successfully defended his portion of the World Heavyweight championship four times since winning the title from Bermane Stiverne in January 2015 and now finds himself as the longest reigning champion in the division currently. An interesting question that will be asked of Wilder as he prepares for his fifth title defense on February 25th against current WBC number twelve rated contender Andrzej Wawrzyk will be how he can come back from injuries after suffering a broken right hand and torn right biceps in his last title defense against Chris Arreola. If the champion can show no ill effects from the injuries he suffered in that fight and can successfully defend his title for the fifth time, it would not surprise this observer to see him in a unification bout for what would be his sixth defense of the WBC world championship. As for whom that opponent would be assuming Wilder is successful against Wawrzyk in February, there could be a few possible options, each presenting an interesting challenge. The most likely opponent in my eyes would be undefeated IBF Heavyweight world champion Anthony Joshua. Joshua, who won the IBF world championship in April of last year with a second round knockout of Charles Martin, went on to successfully defend his championship twice scoring dominant knockout wins over Dominic Breazeale in June and in his last fight in December against former world title challenger Eric Molina. Much like Wilder, Joshua has thus far been the definition of a “Knockout Artist” winning all eighteen of his professional fights by knockout. Before a potential fight between Wilder and Joshua can be made, it was announced shortly after Joshua’s victory over Eric Molina that he will make the third defense of his IBF world championship against Wladimir Klitschko on April 29th at the legendary Wembley Stadium in London, England. In addition to Joshua’s IBF crown, it was also announced that the vacant World Boxing Association (WBA) Heavyweight world championship will also be at stake. Although there is much more to discuss with regard to the Heavyweight division, a logical scenario that would play perfectly into one of the subjects on this observer’s “Boxing Wishlist For 2017” would be for the winner of Joshua-Klitschko to face the winner of Wilder- Wawrzyk to further unify the World Heavyweight championship. As there always seems to be in the sport of Boxing however, there are other scenarios that could be a factor in whether such a concept of further unification takes place as described. In regard to the World Boxing Council (WBC), the status of its number one contender position is very much in the air. One thing that Deontay Wilder has been unfairly criticized for during his title reign by some in my eyes is the fact that he has not faced a mandatory challenger as of yet. Some may remember that Wilder was prepared to defend his world championship against WBC number one rated contender and former world title challenger Alexander Povetkin last May in Russia, but the fight was cancelled days before it could take place due to Povetkin testing positive for the banned substance Meldonium. Povetkin was scheduled to fight former world champion Bermane Stiverne on December 17th in Russia in what was to be an official elimination bout where Povetkin’s number one ranking and interim championship status in the WBC’s Heavyweight ratings was to be at stake. As was the case with the cancelled encounter with Wilder, the bout between Povetkin and Stiverne was also cancelled, this time on the day the fight was to take place when it was revealed by WBC president Mauricio Sulaiman that Povetkin had tested positive for another banned substance Ostarine resulting in the WBC withdrawing its sanctioning of the fight and Stiverne pulling out. Povetkin subsequently fought and scored a six round knockout over last-minute substitute and former world title challenger Johann Duhaupas later that day. Although Povetkin failed twice in 2016 in regard to voluntary anti-doping tests conducted by the Voluntary Anti-Doping Agency (VADA) as part of the WBC’s Clean Boxing Program, the status of his number one ranking remains unknown as of this writing, but it was recently announced that the “B” sample of Povetkin’s test prior to what would have been his fight against Bermane Stiverne will be opened at Povetkin’s request. What will be interesting in this observer’s eyes assuming that the second sample comes back negative for any banned substances is whether the WBC will mandate that the fight between Povetkin and Stiverne still take place or if the second sample confirms the original results if Stiverne will be named the number one contender and thus take over the designation as having interim championship status in the WBC’s Heavyweight ratings. What could make that interesting is it could open the possibility of a rematch between Stiverne and Wilder assuming Wilder is first successful in his title defense against Andrzej Wawrzyk and assuming that a fight with the Joshua-Klitschko winner is not made in the immediate future. We will have to wait and see what the result of Povetkin’s “B” sample will be and what the World Boxing Council will ultimately rule on this matter. In regard to how the World Boxing Association (WBA), World Boxing Organization (WBO), and the International Boxing Organization (IBO) will also fit in to the landscape in 2017, there are a few possibilities. Although the vacancy in regard to the WBA’s version of the World Heavyweight championship will be filled when Anthony Joshua meets Wladimir Klitschko in April, some may remember a tournament concept that was started by the WBA in January of last year with the goal of determining one champion and eliminating at least with regard to the Heavyweight division, interim/regular championship designations in it’s rankings. For a variety of reasons including some of the circumstances which led to the cancellation of the Tyson Fury-Wladimir Klitschko rematch, two fighters remain that will determine a mandatory challenger for the Joshua-Klitschko winner in regard to the WBA. It was recently announced that the WBA has ordered negotiations between former WBO Heavyweight world champion Shannon Briggs and longtime contender and former world title challenger Fres Oquendo, with the winner of that potential fight possibly facing current WBA number three rated contender Alexander Ustinov before facing whomever the reigning WBA champion might be. In regard to the International Boxing Organization (IBO), their version of the World Heavyweight championship will also be on the line in the Joshua-Klitschko bout. As for the World Boxing Organization (WBO), it was recently announced that undefeated WBO number two rated Heavyweight contender Hughie Fury, cousin of Tyson Fury has entered negotiations for a potential challenge of newly crowned undefeated WBO world champion Joseph Parker. What is also interesting with regard to the current WBO Heavyweight ratings is current WBO number one rated contender and former two-division world champion Daviid Haye will face current WBC Cruiserweight world champion Tony Bellew on March 4th in a twelve round Heavyweight bout in London, England. Although Bellew will be fighting for the first time as a Heavyweight as a professional, one should assume that Haye’s number one ranking would be at stake. 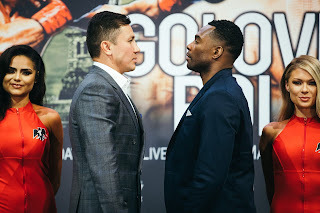 There are also possibilities of rising prospects and former world title challengers, who are not currently involved in the discussion in terms of the top of the Heavyweight division, who will be looking to enter the picture. A potential fight that I think would draw interest if it could be made would involve undefeated WBA number eight rated contender and knockout artist Jarrell Miller and recent world title challenger Andy Ruiz, who suffered a narrow loss to Joseph Parker in a fight for the vacant WBO Heavyweight world championship on December 10th, could catapult the winner into a potential world championship opportunity. It will be interesting to see if Miller, Ruiz or other top contenders like Luis Ortiz or Kubat Pulev will be able to get closer to a world championship opportunity in the year ahead. What all of the above represents may give the impression, particularly among casual Boxing fans of a complicated picture with so many possibilities and various political aspects that surround the sport, which also may have play a role in the potential fights that could happen and/or rulings that could be made. If nothing else, the landscape of the division should provide some intrigue in the year ahead. If the fights that have already been made can produce fireworks, any potential bouts that might follow are likely to reap the benefit from those encounters. Exciting fights often generates interest and if one clear Undisputed Heavyweight world champion does indeed emerge from this puzzle of champions and contenders, the better for the sport.